Receive your free subscription to the Journal of Refractive Surgery. 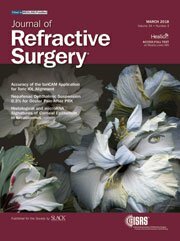 Get the latest developments and surgical techniques in refractive, cataract and lens-based surgery, from the leading peer-reviewed journal in the subspecialty. What else do ISRS members receive? 1. Extended Depth of Focus IOLs: The Next Chapter in Refractive Technology? Presbyopia-correcting intraocular lenses (IOLs) have revolutionized refractive cataract surgery as evolution in materials and optical designs allowed for a better balance of functionality while reducing unwanted symptoms. Authors explain the Tomographic and Biomechanical Index (TBI), which combines Scheimpflugbased corneal tomography and biomechanics for enhancing ectasia detection. Authors report short-term results of pulsed ciliary muscle electrostimulation to improve near vision, likely through restoring accommodation in patients with emmetropic presbyopia. The authors found that small deviations were frequent when comparing two sophisticated technologies. Topography-guided LASIK was superior in all visual performance parameters studied, both subjective and objective. To facilitate communication and provide consistent, readily accessible protocol details for the reader, we are now recommending using a standardized “CXL Methods” table for every article reporting on CXL methodology. Authors evaluate and compare quality of vision and reading performance outcomes after implantation of bifocal refractive-diffractive, bifocal apodized diffractive, or trifocal diffractive-refractive intraocular lenses (IOLs). Authors compare the clinical outcomes of small incision lenticule extraction (SMILE) and wavefront-guided LASIK (WFG LASIK) in eyes with low and moderate myopia. This four-stage procedure appears to be an effective and safe approach for corneal stabilization and improvement of functional vision in patients with keratoconus. The EDOF IOL design provided a wide range of improved visual and reading function between far and intermediate distances and also improved near visual acuity.